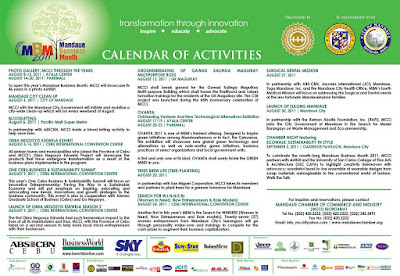 True to its Vision, To be the prime mover of growth and development in Mandaue City, the Mandaue Chamber of Commerce and Industry (MCCI) with its flagship event named Mandaue Business Month 2011 proudly presents its list of series of events for this month-long celebration of growing one's business and so with the community, Mandaue city and the province of Cebu. Awarded as Best Chamber in Central Visayas, MCCI partnered with various local and national companies, entities and businesman or entrepreneurs for this year's series of events and activities which basically aimed to uphold and develop a sustainable economy where business takes on a leadership role in using environmentally friendly technology, practicing social responsibility, integrating human resource development and enforcing policies that promote responsible business performance while achieving growth. One of the highlights this year is the Search for W.I.N.N.E.R.S or Women In Need, Now Entrepreneurs & Role Models in which 27 women entrepreneurs from different Mandaue City barangays vie for this single title and will go through personality make-over (not your common and beauty pageant make-over) and trainings to compete for the cash prizes which will augment their business capitalization. Please click above/attached poster for the complete list of events.